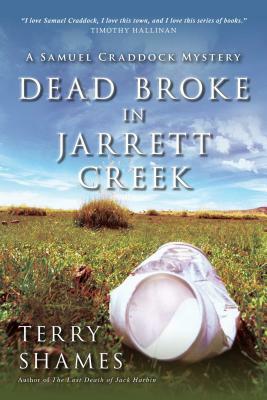 The small town of Jarrett Creek is bankrupt. Samuel Craddock thought he was retired but now he's been asked to return as police chief. Gary Dellmore, heir apparent to the main bank, is dead, apparently murdered. Dellmore supposedly had a roving eye, although his wife says he was never serious about dallying. Still, Craddock wonders: Did the husbands and fathers of women he flirted with think he was harmless? What about his current lover, who insists that Dellmore was going to leave his wife for her? Craddock discovers that Dellmore had a record of bad business investments. Even worse, he took a kickback from a loan he procured, which ultimately drove the town into bankruptcy. Many people had motive to want Dellmore dead. Then the investigation turns up another crime. As Craddock digs down to the root of this mess, many in Jarrett Creek are left wondering what happened to the innocence of their close-knit community. "Following up on her stellar debut, Shames proves that she isn't a one-hit wonder. . . . [Her] grizzled, world-weary Craddock is a nuanced and artfully drawn character who embodies the positive values of small-town Texas as he gets deeper into a multilayered story of trust and betrayal. Jarrett Creek is much more than a backdrop--it's a complex character in the story. Samuel Craddock is a hero worth rooting for. . . . Highly recommended."